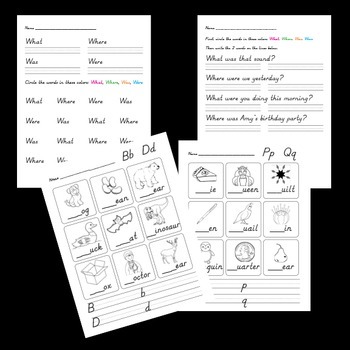 This download includes 4 worksheets. 2 worksheets use the words: what, where, was and were. My kids frequently confuse these 4 words so these worksheets are designed to help students accurately read and identify them. The second 2 pages are for identifying/writing commonly confused letters. One is for P / Q and the second is for B / D. Students will write these letters (both upper and lower case) and determine which letter begins a word (__ueen). Great for reinforcing commonly confused letters and words all throughout the year.